The team stops for a photo in front of the Olympic stadium in Barcelona, Spain. Photo courtesy of Butler men’s basketball Twitter account. Senior Tyler Wideman, redshirt sophomore Sean McDermott and team manager Davis Furman had just 20 minutes to find ice cream in Valencia, Spain. Several sand sculptures diverted their attention, so the Butler basketball buddies stopped to snap some photos. Wideman and Furman looked back and noticed a lanky gentleman strolling the boardwalk. Manu Ginobili, the legendary San Antonio Spur, approached the two seniors and redshirt sophomore. Meeting an elite NBA player was just one of many highlights of the Bulldogs’ venture abroad. Butler went 4-0 on the trip, defeating various European professional teams in exhibition games. NCAA rules permit foreign trips every four years. The Bulldogs most recently traveled to Australia in 2013 and Italy in 2009. Head coach LaVall Jordan, a 2001 Butler graduate, played during Butler’s 2000 trip to Finland. The team traveled to Madrid, Albacete, Toledo, Valencia and Barcelona. 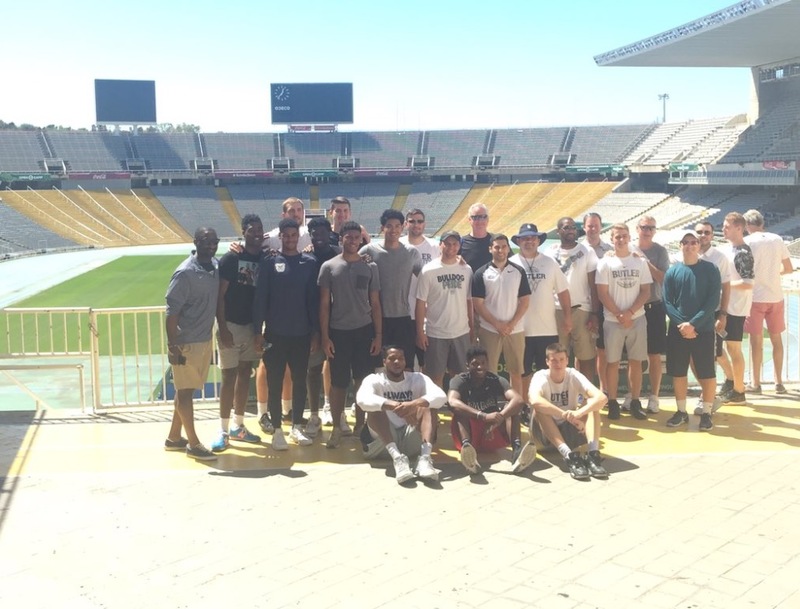 Senior Kelan Martin said the team had a special bond both on and off the floor in Spain. The NCAA allows teams embarking on foreign trips 10 additional practices in the summer to prepare. The players had never ventured to Spain prior to the trip. Martin, who celebrated his 22nd birthday in Madrid, made note of another enjoyable aspect of the 10-day tour. A week before the Bulldogs packed their bags for Spain, associate athletic director John Dedman gave sophomore Joey Brunk the opportunity to write a series of blog posts for the IndyStar. An Indianapolis native, Brunk jumped on the chance to document the trip for the newspaper. The forward/center penned six entries in the “‘Dawg Diary.” He touched on topics near and dear to his heart: the Spanish cuisine, John Mayer and zoos. While the Bulldogs enjoyed the pleasure, they also thought of the overseas excursion as a business trip. Freshman Cooper Neese, who recovered from a broken thumb, said he felt comfortable playing with his new teammates in the latter games. Jordan has served as head coach for just over two months. This season will be his first at the helm. Although the future remains unclear, Neese said he is confident in the squad’s abilities and cannot wait to put on a Butler uniform. The Bulldogs will begin exhibition play on October 28 against Hanover College at Hinkle Fieldhouse.